Not even Lance Armstrong did this. The seven-time Tour de France winner who is currently the subject of the latest in a seemingly unending series of doping allegations and lawsuits was in happier times known for his transformation from cancer survivor to cycling legend. But friend and neighbor Pat Navin has done the Texan one better for the past seven weeks. Every Monday through Friday since May 29, the lean and lanky Navin has donned his biking outfit in the early morning. He’s mounted his trusty copper LeMond Wayzata, pedaled from his house on Cleveland Street in Evanston to the Lake Shore trail head at the intersection of Ardmore and Sheridan Roads, and ridden along the spectacular route to the University of Chicago. Once at his destination, he’s been treated for an aggressive form of prostate cancer that he learned about last October. At the beginning of the process, Pat said he didn’t know if he would be able to ride every day. The side effects of his hormone therapy and radiation are numerous. On the third day, he encountered a torrential downpour and 49 degree temperatures. The last couple of weeks have brought many days of blistering heat. 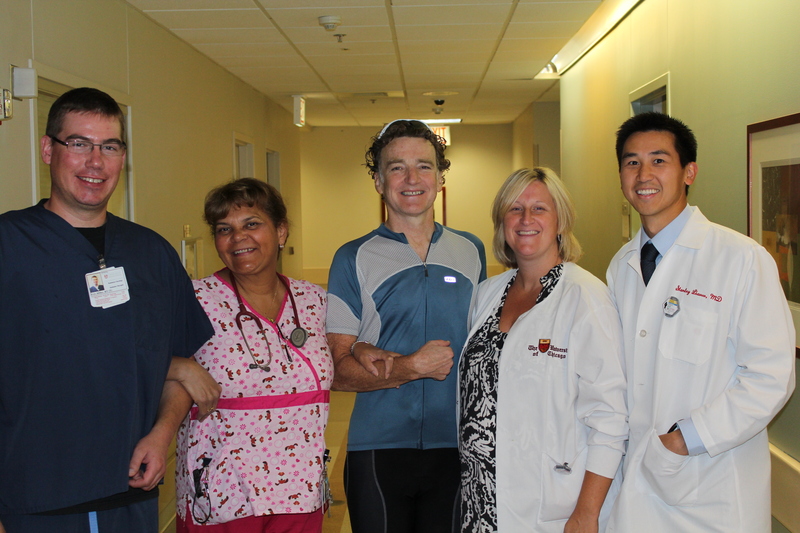 Pat’s been treated by a dedicated team headed by Dr. Stanley Liauw, a radiation oncologist, clinician and researcher. After the daily treatment, Pat’s biked to the Millennium Bike Center where he is a fixture, showered and changed, and put in work at the advertising agency he owns and runs before getting on the bike and heading for home. That’s 44.7 miles per day. On one level, for people who know Pat, this routine is not surprising. Those of us who frequent the bike shed know there are varying levels of commitment to riding. Pat’s is among the very top. Regardless of the season or available light in the morning or evenings, he very rarely misses a day of commuting on his bike. His riding during his treatment, then, can be seen as an extension of an activity for which he has deep passion and in which he finds serenity, joy and meaning. This is an extraordinary display of guts and resistance in the face of a relentless disease that has among its many consequences the literal erosion of one’s physical being. Pat’s had company along the way. He says that his lovely wife Carol and friends Frank Shaw, Tom Waterloo, Tom Arndt and Steve Schwartz have allowed him to draft off them (Although I know from having ridden with Pat, there’s a strong chance they may be benefiting from his going first into the wind.). A little while ago Pat also had an insight: he should use his riding as a fundraiser to help Liauw support his prostate research. On Thursday he sent out a letter detailing his interrelated biking and cancer journeys and asking others to join him in this effort. “Stan Liauw is an impressive person. He is intelligent, compassionate, honest and humble. When I told him that I would like to raise some money for his research (more on his research in a moment), he was welcoming, but quite humbled and grateful. He told me that even a couple thousand dollars would go a long way, allowing him to hire some graduate students to do, as he said, so much of the “grunt work” involved in clinical research. My wife Dunreith and I are in, and I hope you’ll be, too. On Monday, about a dozen friends will gather at 6:30 a.m. at the Navin house to accompany him on the last of his 38 treatments. After completing the ride, they’ll have some coffee and celebrate the end of this chapter. Knowing Pat, it is likely to be a celebration animated by a visceral understanding of life’s fragility. Cancer is a brutal and relentless disease, and, sadly, the hard truth is none of us know what will happen to him. But we do know what he’s done and how he’s faced one of the biggest, if not the biggest, challenge of his full life. Until recently, and still for many, Lance Armstrong has been considered the standard of courage in the face of cancer. I know who I’ve got. He doesn’t live in Austin, Texas. This entry was posted in Current Books. Bookmark the permalink. Thank you for kind write-up, Jeff. Last day tomorrow!